The invention of suspension bicycles more than 30 years ago, brought with it the science of a smoother being a faster one. In the Paris Roubaix spring classic the riders conquer over 250 kilometers of racing including sectors of cobblestones that jostle the rider to the bone. Specialized worked with their WorldTour riders to improve their innovative front suspension road bike. The 2020 Roubaix is the only bike that is raced in the WorldTour that features hydraulic suspension. 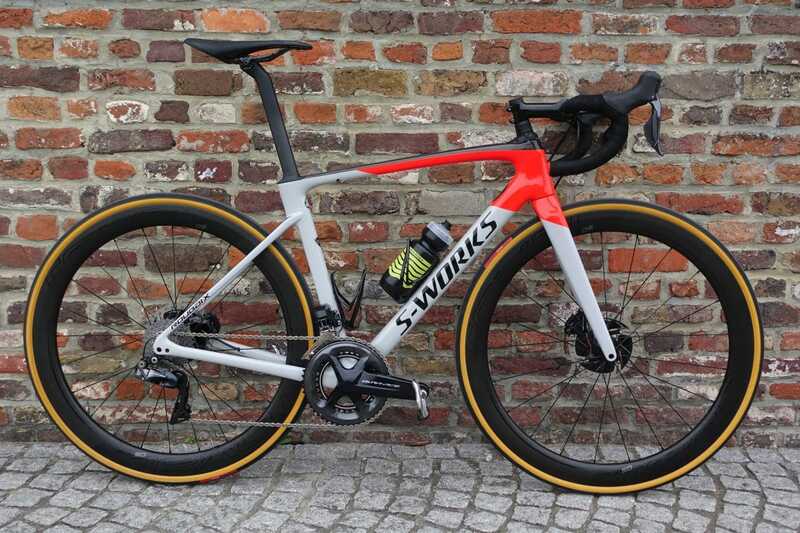 The team at Specialized achieved this all while keeping the frame weight lower than their Venge and keeping the frame more aerodynamic than their Tarmac. Performance was key to the design of the frame, the 99.5cm wheelbase and 73.5 head tube angle keep the bike feeling quick and responsive. The bike is available in 11 sizes, from 44cm to 64cm. Specialized intends for the bike to be gender neutral, using their database of Retul fit number the brand determined that there is only a minimal difference in general sizing so the frames can fit men and women both. The engineers in Morgan Hill were told it would be impossible, but the future shock front suspension is now adjustable. Thanks to a single circuit hydraulic damper rather than a spring from the previous version, a headset cap knob can adjust the compression and rebound of the future shock. This gives the rider more control of their ride, with the ability to choose to lock out the front end. Due to the shape of the knob, Specialized developed the Future Stem. The stem compensates for a gap in the knob and creates a cleaner look in the overall aesthetic. The front end wasn’t the only piece updated to improve rough ride quality, Specialized lowered the seat clamp wedge. The lowered clamp works in tandem with the spec’d Pavè seat post to allow more flex through the post above the clamp. We headed out, for the truest test of the improved Roubaix. Coated in a slick layer of rain the flat farm roads of northern France the proving ground for our test. Our Shimano Dura Ace Di2 equipped Roubaix was quick to wind up to speed. The frame was responsive and we didn’t feel the need to adjust the Future Shock out of its closed position. We hit the cobbles for the first time and we’re unsure of the effectiveness of the new system. The jostling and sharp bumps were shaking us through. But once we made it through the kilometer long sector we noticed we forgot to twist the knob open. Oops. We headed toward the famed Arenberg Pavè next. Approaching the sector we twisted the cap and approached the cobbles. While the Arenberg is unlike any other sector in the area due to its large spaced out cobbles and minimal maintainence, simply switching the dial open made the ride noticeably smoother. With the added traction and control we were able to power over the cobbles and complete the sector much quicker and with much more ease than we anticipated. Our Shimano Dura Ace Di2 drivetrain was quick and responsive in its shifting. Throughout the rest of the ride we found ourselves toggling the future shock to meet the needs of the road. The adjustment allowed us to compensate for the quality of the road and improve traction which made our efforts that much more efficient.